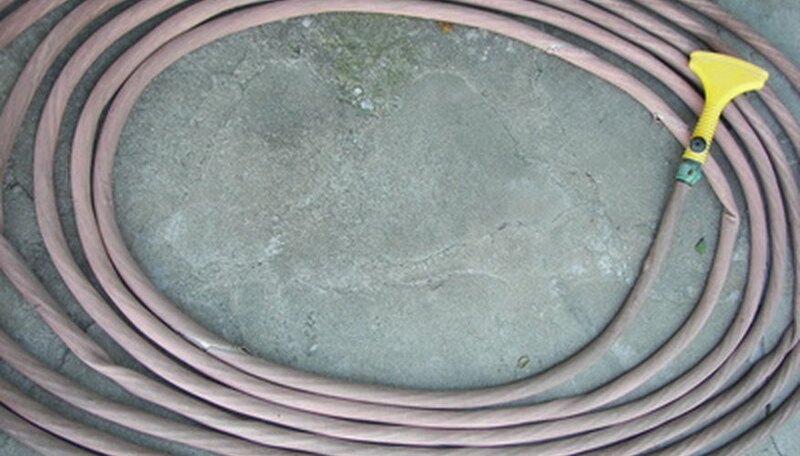 Garden hoses can become tangled when left to sit on the ground in an unsightly heap. This led to the creation of hose reels to hold hoses neatly off the ground. Commercial reels can be expensive and may not accommodate the length of your garden hose. An alternative is to make your own garden hose reel from wood and PVC pipe. This project takes roughly an hour to complete. Set up one of the boards between the two vices. Measure from both ends of the 12-inch side of the board to the center. Mark the center. Cut a circle through the center with the scroll saw to a diameter of 2 inches. Repeat for the second board. This makes the two ends of the reel. Apply epoxy to one end of a PVC pipe. Insert the coated end of the pipe into the hole on one of the wooden reel ends. Place the board on the ground with the pipe sticking up. Allow this to dry. Apply epoxy to the open end of pipe. Set the pipe through the hole of the second board. Turn the whole assembly over so that the second board is on the ground with the pipe sticking up. Allow this to dry. Have the two boards parallel to each other. Drill a hole into the pipe near the wooden reel end resting on the ground. The hole should be between the two wooden ends. Screw the hook into this hole. This becomes the holder for the hose. Dig a 12-inch hole into the ground near the water supply for the garden hose. Put the dowel into the hole. Set the dowel straight up. Fill in dirt around the dowel and press the dirt flat around the dowel. Slide the other piece of pipe over the dowel. Let the pipe end rest on the ground. Set up the other pipe with the wood attached so the hole slides over the dowel. Slide the second pipe down to the first pipe. The second pipe will rest on top of the first pipe. Adjust the hook so that the open end of the crook faces north. Attach the hose to the water source. Hook the other end of the hose onto the hook at the reel. Turn the reel to wind up the hose around it. Wind the hose around the reel using the hook to hold the hose to the reel. Start the hose at the bottom and work up. Layer the hose over itself at the top and start back down if you have a long hose. The hook will be covered up by the hose. Use a metal dowel for stronger performance and durability.